Description: Dine-Aglow was the first company to produce and design a throw away oil table lamp solution for dining area lighting in restaurants. Dine-Aglow disposable table lighting transformed the food and beverage industry with their copyrighted, safe, 100% recyclable, disposable fuel cartridge system which is utilized throughout the world by more eating venues than any other table lamp solution. The oil used last longer and burns cleaner than any other product. 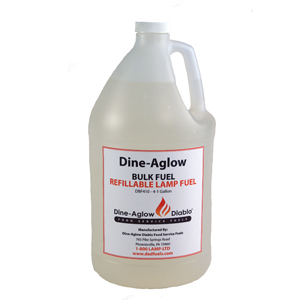 Our bulk fuel Dine-Aglow Disposable Table Lighting option is great for refilling tiki torches and other outdoor fuel based lighting.